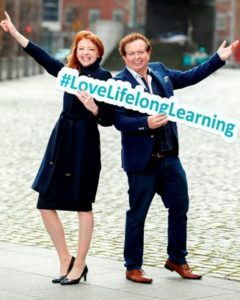 Pictured at the launch of the 12th annual Adult Learners’ Festival in Dublin were: Marty Morrissey, Dancing with the Stars contestant and RTÉ sports commentator, and Niamh O’Reilly, CEO of AONTAS. What is the Adult Learners’ Festival about? Coordinated by AONTAS, the National Adult Learning Organisation, the Adult Learners’ Festival is a nationwide celebration of adult learning which has been running for 12 years. Thousands of information sessions, taster workshops, and sample lectures take place around the country each year. The 2018 Adult Learners’ Festival will run from March 5-9. The week-long programme of events and workshops throughout the country will serve to highlight the value of lifelong learning and to showcase the learning opportunities available locally to adults. This year AONTAS is collaborating with the Belfast Festival of Learning to ensure an all-island approach. On Monday, 5 March, Marty Morrissey will be master of ceremonies at the AONTAS STAR Awards. Shortlisted adult learning projects from across Ireland will convene and the winners of this prestigious award will be announced on the day. On Friday 9 March, 10am – 1.30pm, a ‘Lifelong Learning for All’ policy event will be held in Buswell’s Hotel, Dublin to facilitate debate on how to create a more equitable system of Lifelong Learning in Ireland. Guest speaker Stephen Evans from the UK, CEO of Learning and Work Institute, will focus on ways of widening participation in lifelong learning for workers. AONTAS encourages everyone to get involved in the Adult Learners’ Festival. Organisations are invited to hold an event as part of the Festival and help to collectively showcase the range of learning opportunities happening in communities around Ireland. From Education and Training Boards (ETBs), to Community Education Centres, to Higher Education Institutes, lots of groups are organising learning activities or courses to showcase their work. Putting your adult learning organisation on the map! In order to support groups to take part in the Adult Learners’ Festival, AONTAS has created a range of promotional material including posters, flyers, balloons, t-shirts and mini hashtags #LoveLifelongLearning. Organisations can register their adult learning events at www.aontas.com to be included in the nationwide advertising campaign. AONTAS is also offering a limited number of €100 contributions to AONTAS members to help support events. As part of the Festival, AONTAS will be running an extensive social media campaign. Using the hashtag #LoveLifelongLearning, groups are encouraged to share details of their events, or events in their local community.